My first trip of the season to O’Brien Field, home of the Peoria Chiefs, was a good time, as usual. My wife, Laura, went to the game with me, and we kicked off the baseball part of our visit to Peoria by watching some batting practice through the cast-iron gate that surrounds the ballpark. 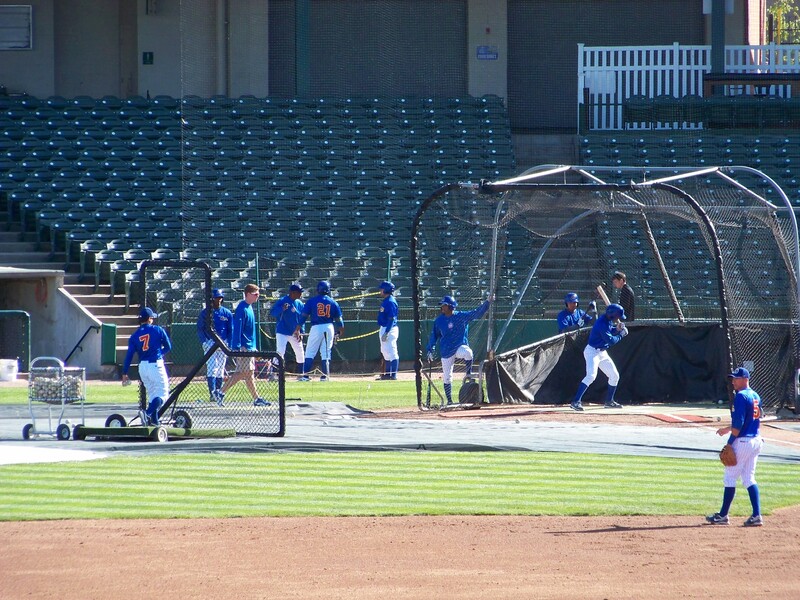 Peoria Chiefs player/coach Kenny Socorro throws batting practice to teammates before Wednesday night’s game. Not only did Laura get a BP ball that came to rest outside the park, but during the game she got a foul ball that ricocheted near our seats a few rows behind the visitors dugout. The foul ball was hit by Quad Cities River Bandits DH Colin Walsh, who hit .500 (7-for-14) in the 2011 Midwest League playoffs. As part of the Chiefs’ season-long celebration of the franchise’s 30th anniversary, tickets for the game were only $3.50 for club box seats and $2.50 for lawn seats (as they were for the entire three-game series), reflecting the cost of admission at Meinen Field (later called Vonachen Stadium) in 1983. Those seats normally cost $10 and $7, respectively, so the discounted prices were even better than what they are on Half-Price Mondays. Also as part of the 30th anniversary celebration, Chiefs players wore 1983 Peoria Suns throwback jerseys throughout the series. 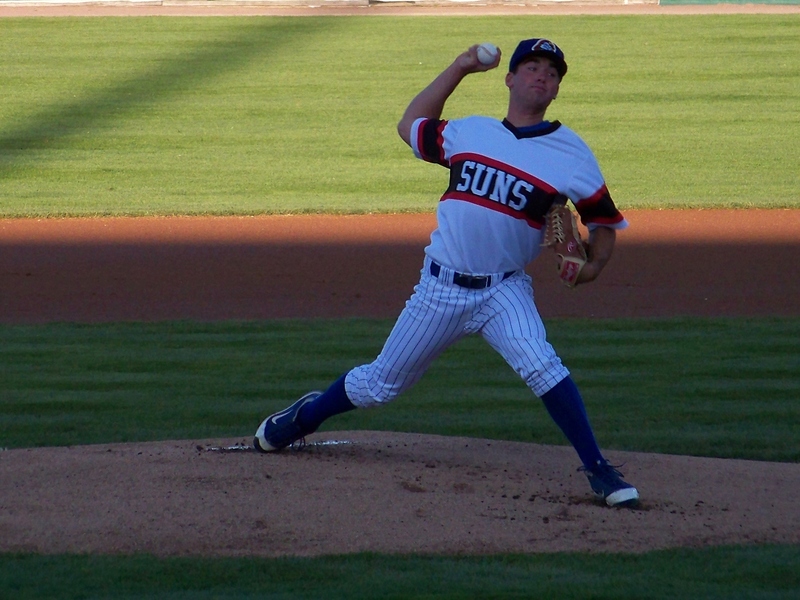 As you can see in the photo below, the 1983 Suns jerseys look a lot like 1983 Chicago White Sox jerseys. 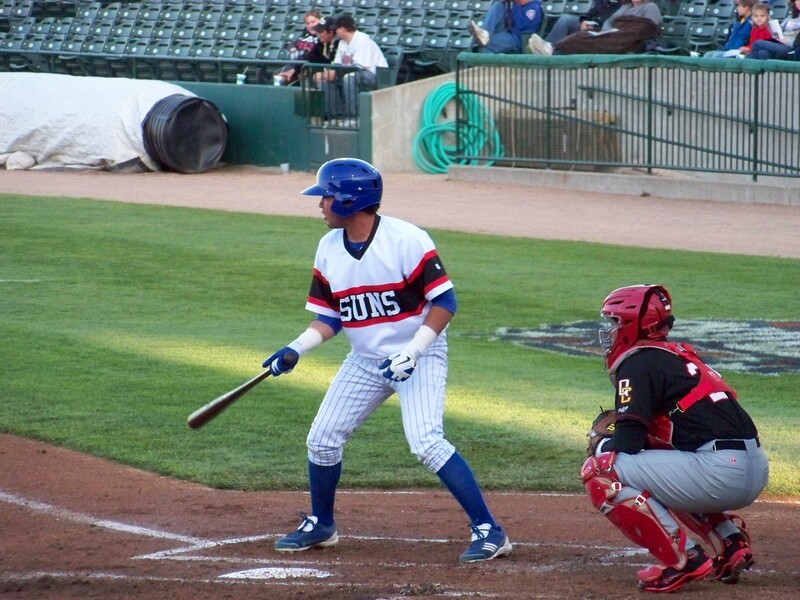 Peoria Chiefs RF Eduardo Gonzalez and his teammates wore 1983 Peoria Suns throwback jerseys Wednesday night. After losing the first two games of the series to the River Bandits, the Chiefs won Wednesday’s game 5-3. The big blow for the Chiefs came in the 4th inning when 1B Ryan Cuneo hit a 3-run homer to right field. Peoria Chiefs 1B Ryan Cuneo swings at a pitch during the 1st inning of Wednesday’s game. The River Bandits scored first after leading the game off with three straight singles off Chiefs SP Michael Jensen. After LF Anthony Garcia struck out, 1B David Medina cleared the bases with a double that gave Quad Cities an early 3-0 lead. Jensen quickly settled down after the 1st inning, retiring 17 of the last 19 batters he faced. He struck out five batters during his six innings of work. Since I shot a lot of photos of throwback jersey-wearing Chiefs players Wednesday, here is a bonus photo of LF Reggie Golden, who is ranked No. 17 among Chicago Cubs prospects in this year’s Baseball America Prospect Handbook. Peoria Chiefs LF Reggie Golden went 1-for-3 with a walk Wednesday. 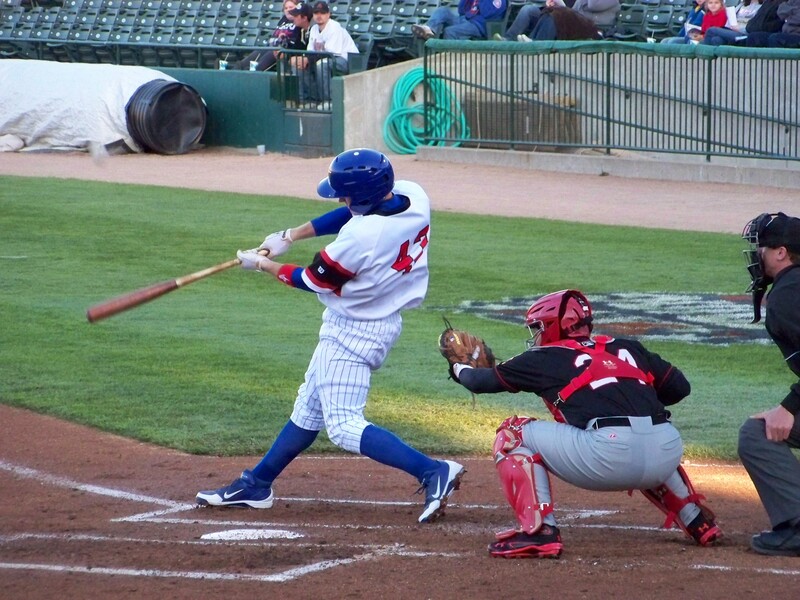 The Lansing Lugnuts are off to their best start in team history. After beating the Dayton Dragons 7-4 Wednesday, the Lugnuts have won six straight games to start the season. 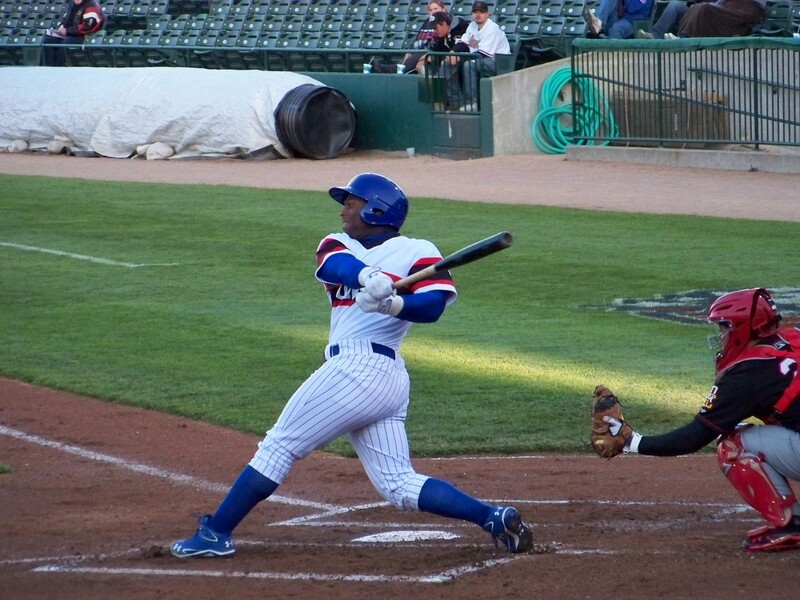 The team’s previous record was set in 2004, when the Lugnuts won their first five games of the season. Cubs fans will recognize several names from that team’s pitching staff, most notably Carlos Marmol (14-8, 3.20 ERA, 154 Ks in 154.2 IP), Sean Marshall (2-0, 1.11 ERA, 51 Ks in 48.2 IP) and Randy Wells (6-6, 4.43 ERA, 121 Ks in 107. 2 IP). Ryan Dempster and Mark Prior both made rehab appearances with the team. Including them, 11 players who pitched for the 2004 Lugnuts went on to do so in the major leagues. Among the notable pitching performances in baseball Wednesday were those by Cedar Rapids Kernels RHP Austin Wood and South Bend Silver Hawks RHP Archie Bradley. Wood threw five hitless innings and notched five strikeouts against the Clinton LumberKings. In his season debut against the Wisconsin Timber Rattlers last week (which I saw in person), Wood struck out 10 batters in five innings. Finally, in former Midwest Leaguer news, Johnny Damon is expected to sign with the Cleveland Indians. Damon played 127 games with the 1993 Rockford Royals, hitting .290 with 5 HR, 50 RBI and 59 SB. Those stats earned him the Midwest League Prospect of the Year award. This entry was posted in 2011 Playoffs, Beloit Snappers, Cedar Rapids Kernels, Clinton LumberKings, Dayton Dragons, Fort Wayne TinCaps, Lansing Lugnuts, Midwest League, Peoria Chiefs, Quad Cities River Bandits, South Bend Silver Hawks, Wisconsin Timber Rattlers. Bookmark the permalink.